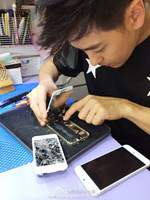 Jimmy Lin is many things – singer, actor, racecar driver and apparently something of an iPhone technician. A photo posted on his Weibo account shows Mr. Lin working to replace the screen of a friend's iPhone 5s that was ran over by a car. A 5.5" Apple iPhone in the lower-right corner? Big Foot is in the frame too – or should we say a 5.5" iPhablet. Alleged photos of the upcoming Apple iPhone 6 have been making the rounds, including ones Jimmy Lin posted himself last week. That one is said to have a 4.7" screen, but the mysterious iDevice in this shot is just too big to have a 4.7" screen. Better still, TechSmartt received dummies of the 4.7" and 5.5" iPhone versions and made an extensive video showcasing both. The 5.5" model is bigger than the 5.5" LG G3 and even the 5.7" Samsung Galaxy Note 3. This isn't the first time a 5.5" iPhone has leaked, a Foxconn press release stated black on white that there are 4.7" and 5.5" iPhone en route. A couple of weeks later we even saw photos of both devices, which share the same iPod Touch-inspired design. The new iPhones are expected on September 19 but could come as early as August. Thanks to Keaton for sending this in! It will look like a brick being used to make and receive calls. LMAO. Yes functionality... That's why I bought an iphone.